Extreme Sport Business Sign - - for any business related to extreme sports. This large 16" x 10.5" plaque is personalized with a logo of your extreme sport and your business or store name. Wall mount. Made in the USA. Specifically designed for a business that sells to surfers, snow skiers, water skiers, skateboarders, and fans of other extreme type sports such as go carting, snowmobiling, trick cycling, ATVing, hang gliding, parachuting, and free falling. The extreme sport image you select is at the top of the sign. Line 1 holds up to twelve (12) 1-5/8" characters. Line 2 holds up to ten (10) characters. 16" x 10.5" oval sign made from sturdy and UV-stabilized laminated acrylic with engraved personalization. Sport silhouette, characters, and border are permanently engraved into the sign during the production process. Border is the same color as the personalization and accentuates the oval shape. 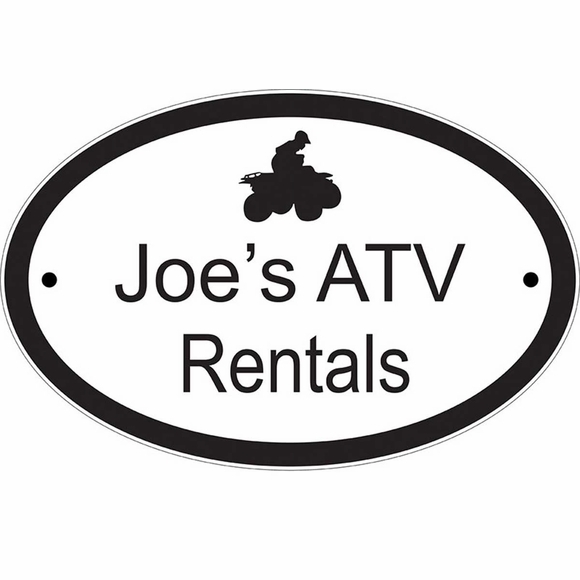 Business name on sample sign: Joe's ATV Rentals.